Simon and Dean manufacture a wide range of lockers available in a variety of colours, including metal and mesh clothes and compartment lockers and tool and equipment lockers and cupboards, including bespoke / custom designs. Clothes and Compartment Lockers - single to six door versions. Tool & Equipment Lockers - secure storage for workshop and production areas. 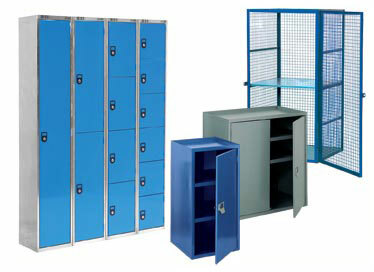 Stainless Steel Lockers - for hygienic and wet work areas. Mesh Clothes and Compartment Lockers - strong, secure and maintaining full visibility and ventilation of contents. Cupbords - General storage cupboards and utility cupboards, with shelves and locks, available galvanised or in a range of colours..